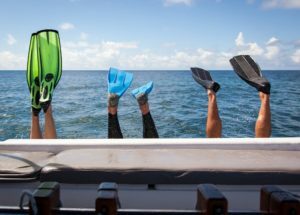 Feeling comfortable during a dive is of great importance. Even something seemingly insignificant could affect negatively your diving trip. Below we give you some tips on how you could avoid motion sickness, from sea motion. Our first concern is to understand what causes motion sickness and it is often called “seasickness”. When some of our body sensors are forced to work down, then we begin to feel a little dazed. This form of nausea is harmless and lasts as long as the movement lasts, maybe a little bit more. The main sensors of our body are the sensors on the inside of the ears, our eyes and the deeper tissues of our skin surface. The ear sensors cannot detect changes in motion, but in acceleration, while the eyes can sense the motion, e.g. of a boat when it begins to move on the waves of the sea. The data of visual perception must be synchronized with the acoustic one and with other sensors too. If the data, delivered to the brain, come into conflict with each other, then it can trigger motion sickness. Scientists, however, are not absolutely sure about what may cause it. Eat well at least 2 hours before you start your voyage. An empty stomach tends to be easily irritated by the movements, so eating is extremely important. Put on a diet of carbohydrates in your breakfast and avoid acidic and oily foods as they can contribute to motion sickness. Finally, avoid alcohol and cigarettes. If you know you are prone to motion sickness, a medicine especially for it, it can help you. These medicines are particularly effective in most people and can thus be a preventive measure for short trips or mild cases of motion sickness. Many divers admit that ginger intake is a simple and delicious way to avoid dizziness. If this works for you, then it is an easy solution. It is not clear yet to the researchers, about how exactly it works and why, but studies show that the ginger root contains a number of chemicals that seem to help relax the digestive activity. As a result, ginger often helps to reduce the risk of motion sickness. In case you start to feel dizzy, just look out the horizon. Your eyes will register the same type of acceleration changes that your ears are reporting. Avoid visual focus on things that are close, and in particular, avoid reading. Also, it’s better to look at the direction the boat is travelling. Odours can completely confuse the signals to your brain, increasing the likelihood of feeling unwell. Avoid smelling fuel fumes, cigarette smoke and perfume. If you are wandering in different locations on the deck of the boat, your body will grasp the different amounts of motion and acceleration, from one place to the other, leading eventually to dizzy. Stay on the deck, to the center of the boat and mitigate the movements. While on the deck, try to avoid become overheated by the sun. The heat increases the risk of motion sickness symptoms much more. So, wear a hat to protect yourself and sit in a shady, cool spot before and after your diving. If you start to feel the first signs of nausea, go into the water just below the surface. This action will relax you and also it will stop the symptoms, because your body will stop receiving conflicting acceleration and movement readings. Motion sickness is something that can be managed or even minimized, adequate sleep, good nutrition, use of medications and taking conscious steps to avoid it during your boat trip. 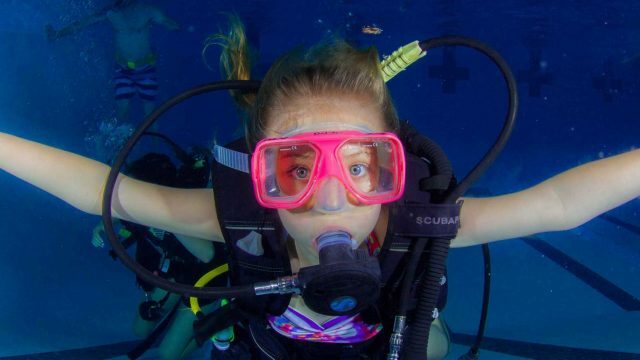 At the ScubAndros diving centre, we know how to protect you and direct you to minimize the symptoms of motion sickness. We provide Scuba Diving courses and tours and all the necessary equipment you need to buy or rent. 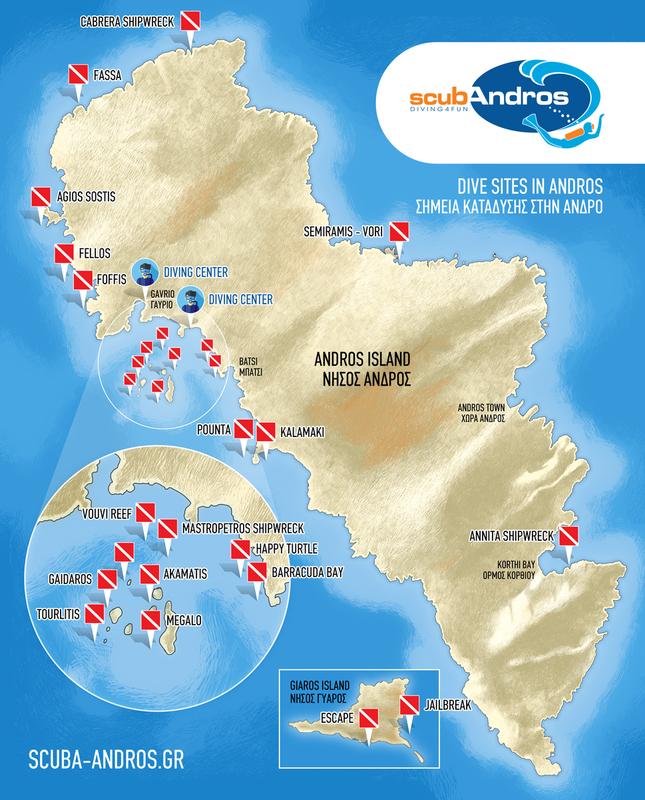 Our diving centre is located on the premises of hotel Perrakis on the beautiful beach of Kypri in Andros.